TeeBlox is a monthly subscription service where you pay $9.99 a month to recieve a little bag of goodies including a licensed geeky t-shirt. You can choose from multiple themes of tops including Gaming, Disney, Cartoons and even Beer. TeeBlox offered me a free 1 year description so I decided to go for the gaming subscription. This sub includes the top, a comic book, stickers, and sometimes badges and posters. This is what I received in February's edition. 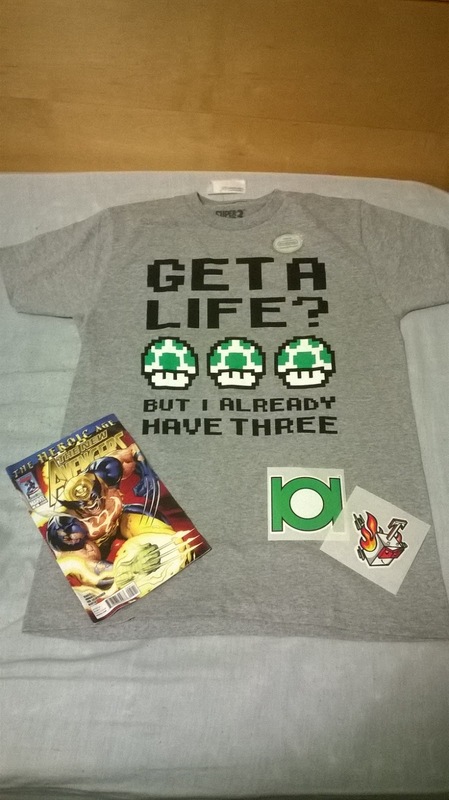 The main item was a licensed Nintendo tee with images of 3 1-Up mushrooms from the Super Mario games with the text "Get a life? I already have 3". 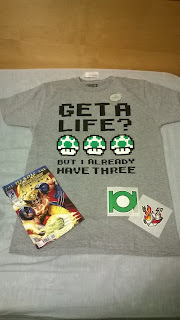 The tee is of very high quality which is expected from a licensed product from as big a company as Nintendo. The game this tee is specifically licensed from in Super Mario 3. Next up I have a "The New Avengers 5" comic which retails at $3.99 so that's already 40% of the money you paid back. Usually the comics come in a plastic sleeve with a card back to protect it but sadly this month's comic did not which has resulted in the comic arriving quite creased and bent but luckily there are no tears in the comic so it is still easy to read. The last things in this month's bag were 2 stickers. One of them being the typical TeeBlox stickers but the other a quite high quality Green Lantern sticker.. Overall I am pretty pleased with the selections this month. The tee was of one of my favourite games and of high quality but the condition of the comic was a bit of a bummer. This month's bag is getting a 7/10. If you would like to get your hand on your own TeeBlox subscription then just click here.